Dragnet’s Joe Friday may have never uttered those words, but he would be impressed nonetheless by the facts on crime. There was a fascinating piece by Erik Eckholm in yesterday’s New York Times on the dramatic reductions in crime over the past several decades. Overall, crime peaked in 1991 and has fallen steadily since then. Max Ehrenfreund (Washington Post Wonkblog) has designated the above “chart of the day” as “something of a Rorschach test. Everyone sees what they want to see in it.” That may be something of an overstatement. Certainly, the advocates of the war on drugs, police militarization, aggressive policing and harsh sentencing laws will view it as evidence that their strategies have worked. They will have the challenge of explaining why similar trends are evident elsewhere, including Canada, that have not embraced the US model. And I am not at all certain of how the Left would make sense of the fact that crime has fallen as inequality has increased. Will the decline in crime have an impact on public policy? 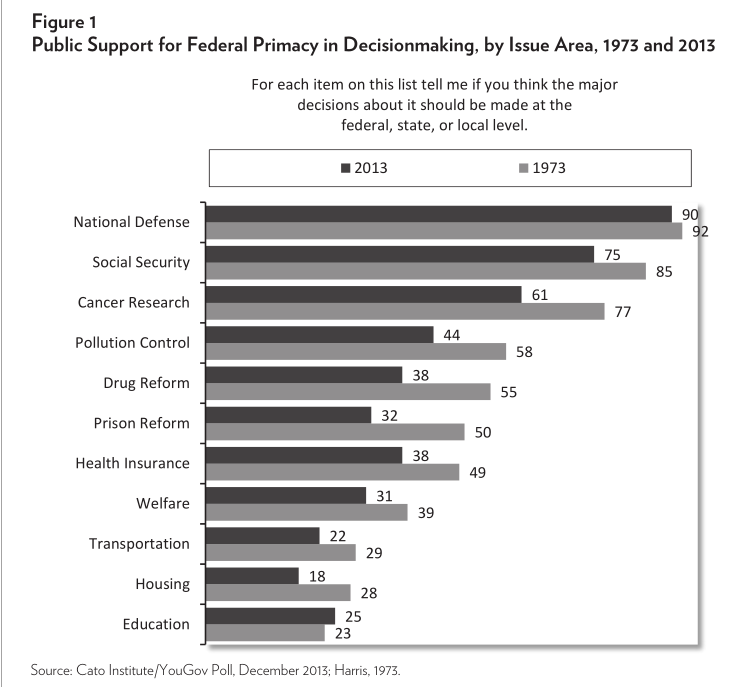 Will it lead to a rethinking of police militarization and mass incarceration? I hold little hope given that public opinion seems immune to the facts. 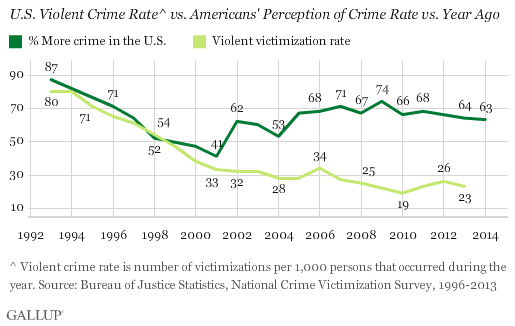 Even if crime has fallen dramatically, according to Gallup the majority of Americans in most years on record believe that crime is getting worse. As Gallup observes: “federal crime statistics have not been highly relevant to the public’s crime perceptions in recent years.” A public concerned with crime and (willfully) ignorant of the long-term trends will continue to demand an aggressive police presence. And that demand will be met. This week we celebrated Constitution Day, by among other things, watching Congress authorize funding for a war that is not a war, and allowing it to be waged on the basis of a 2001 use-of-force resolution that authorized military actions against parties involved with the 9/11 attacks (conveniently, it did not have an expiration date). Asked which party has the most members in the House of Representatives, 38 percent said they knew the Republicans are the majority, but 17 percent responded the Democrats, and 44 percent reported that they did not know (up from 27 percent who said they did not know in 2011). Asked which party controls the Senate, 38 percent correctly said the Democrats, 20 percent said the Republicans, and 42 percent said they did not know (also up from 27 percent who said they did not know in 2011).